..... Click the link for more information. (usually radio waves) to a sample of atoms and then adjusting the frequency of the radiation and the strength of the magnetic field to produce absorption of the radiation. The resonance refers to the enhancement of the absorption that occurs when the correct combination of field and frequency is reached. The procedure is analogous to tuning a radio dial exactly to a desired station. splitting of a single spectral line (see spectrum) into a group of closely spaced lines when the substance producing the single line is subjected to a uniform magnetic field. The effect was discovered in 1896 by the Dutch physicist Pieter Zeeman. (MRI), noninvasive diagnostic technique that uses nuclear magnetic resonance to produce cross-sectional images of organs and other internal body structures. 1929–2007, American chemist, b. Sidney, Ohio, Ph.D. Univ. of Pittsburgh, 1962. Lauterbur was (1969–85) a faculty member at the State Univ. of New York at Stony Brook (now Stony Brook Univ.) and at the Univ. ..... Click the link for more information. , a British physicist, shared the 2003 Nobel Prize in Physiology or Medicine for pioneering contributions that later led to the application of magnetic resonance in medical imaging. Magnetic resonance can also occur without an external magnetic field from interactions of the electron and nuclear spins; such resonance produces the fine and hyperfine structure of atomic spectra. A phenomenon exhibited by the magnetic spin systems of certain atoms whereby the spin systems absorb energy at specific (resonant) frequencies when subjected to alternating magnetic fields. The magnetic fields must alternate in synchronism with natural frequencies of the magnetic system. In most cases the natural frequency is that of precession of the bulk magnetic moment of constituent atoms or nuclei about some magnetic field. Because the natural frequencies are highly specific as to their origin (nuclear magnetism, electron spin magnetism, and so on), the resonant method makes possible the selective study of particular features of interest. For example, it is possible to study weak nuclear magnetism unmasked by the much larger electronic paramagnetism or diamagnetism which usually accompanies it. where Δξ is the energy difference between the magnetic substates and ħ is Planck’s constant. where γ is the gyromagnetic ratio. The selection rules permit transitions only between adjacent substates; therefore, the same resonance frequency corresponds to all transitions (see Figure 1), the absorption lines overlap, and a single line is observed. However, in some crystals for nuclei with spin I > 1 an additional shift of levels takes place because of the interaction of the nuclear quadrupole moment with the extranuclear nonuni form crystalline electric field E at the site of the nucleus. As a result, more lines appear in the absorption spectrum. The magnetic resonance caused by the magnetic moments of electrons in paramagnets is called electron paramagnetic resonance. Its spectrum is a function of both the spin and the orbital motion of the electrons making up the paramagnetic atoms and molecules, and it is usually sensitive to the crystalline field at the site of the paramagnetic particle. In ferromagnets and antiferromagnets the electron magnetic resonances are called ferromagnetic and antiferromagnetic resonance, respectively. In many cases the classic description of magnetic resonance is useful. 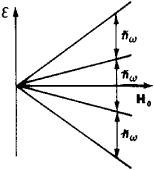 It is based on the fact that in an external magnetic field H the magnetic moment μ of a particle experiences Larmor precession around the direction of the vector H at a frequency ω = γH. A variable magnetic field H1 perpendicular to H and rotating together with μ—that is, at a frequency ω—exerts a steady influence on the magnetic moment and changes its spatial orientation. Cyclotron resonance, which is observed in metals and semiconductors situated in a constant magnetic field and is the resonance absorption of electromagnetic energy associated with the periodic motion of conduction electrons and holes in a plane perpendicular to the field H, is also classified as a magnetic resonance. The frequency range of magnetic resonance depends on the value of the gyromagnetic ratio. For a free electron, γ/2π = 2.799 ×106 hertz-oersted1; for a proton, γ/2π = 4.257 ×103 hertz-oested-1 and for nuclei with spin, γ/2π = 102-103 hertz-oersted1. Accordingly, in magnetic fields of 103to 104 oersteds, the frequencies of electron paramagnetic resonances fall in the superhigh frequency range (109-1011 Hz), and the frequencies of nuclear magnetic resonance, in the shortwave range (106-107 Hz). Al’tshuler, S. A., and B. M. Kozyrev. Elektronnyi paramagnitnyi rezonans. Moscow, 1961. A phenomenon exhibited by the magnetic spin systems of certain atoms whereby the spin systems absorb energy at specific (resonant) frequencies when subjected to magnetic fields alternating at frequencies which are in synchronism with natural frequencies of the system. Also known as spin resonance. When they finally began making conference presentations about the puzzling data--and their nagging suspicions about flaws in magnetic resonance theory itself--their colleagues would have none of it. The eight volume Encyclopedia of Nuclear Magnetic Resonance published in 1996 has established itself as the professional modern reference work on NMR. The Company uses its proprietary Target Visualization Technology(TM) to create imaging agents targeted at the molecular level, designed to enable physicians to use Magnetic Resonance Imaging (MRI) to obtain detailed information about specific disease processes. 0 can be used in Europe for magnetic resonance imaging of the whole body including brain and spine, head and neck region, lung, breast, abdomen, pelvis, kidney, extremities and musculoskeletal system as well as imaging of blood vessels. To produce an image, MRI must detect very faint signals arising from the gyrations of atoms in a magnetic field-a phenomenon known as nuclear magnetic resonance (NMR). This work represents an important step beyond earlier research involving the use of magnetic resonance technology to obtain a sequence of two-dimensional images of a foam (SN: 7/29/95, p.
Although this achievement falls short of detecting individual protons or nuclei in molecules, it represents a significant improvement in sensitivity and spatial resolution over that of conventional magnetic resonance imaging. This detection technique - which relies on the vibration of a tiny sliver of silicon nitride rather than the activation of an electromagnetic circuit - represents a potentially important step toward attaining significantly higher resolution than that achievable using conventional magnetic resonance imaging (MRI). NASDAQ: EPIX), a developer of innovative pharmaceuticals for magnetic resonance imaging (MRI), announced today that its presentation at the Cowen & Co.
A medical physicist has now suggested an alternative, potentially more sensitive means of extracting information from a nuclear magnetic resonance experiment. The VisualSystem product provides true 3D visual stimuli for fMRI (functional magnetic resonance imaging) applications.